Tangent to a circle: A line which intersects a circle at any one point is called the tangent. There is only one tangent at a point of the circle. 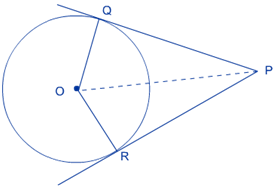 The tangent to a circle is perpendicular to the radius through the point of contact. 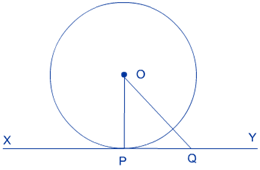 The lengths of the two tangents from an external point to a circle are equal. The tangent at any point of a circle is perpendicular to the radius through the point of contact. Construction: Draw a circle with centre O. Draw a tangent XY which touches point P at the circle. To Prove: OP is perpendicular to XY. Draw a point Q on XY; other than O and join OQ. Here OQ is longer than the radius OP. The lengths of tangents drawn from an external point to a circle are equal. Construction: Draw a circle with centre O. From a point P outside the circle, draw two tangents P and R.